In the shadows of the night, Darian has lived alone for almost a century. Made and abandoned by her former love, Darian is the last of her kind—an immortal Shaede who can slip into darkness as easily as breathing. With no one else to rely on, she has taught herself how to survive, using her unique skills to become a deadly assassin. First Line: I live in the gray. Review: I've had Shaedes of Gray sitting on my shelf since December of last year when it was released. When I bought it I was excited to dive into it but sadly I just now got around to reading it and I wish I did read it when I had bought it because Amanda Bonilla did a really great job in this new Urban Fantasy series. It was fast paced full of supernatural beings of all different kinds, great action scenes, and a plot that held my interest to the very end. I've never read about Shaedes so this was a new concept for me. Darian is a Shaede meaning one who at night can walk in shadow form while in the day light is confined to her corporeal form. She was not born one but was created close to a century ago when Azriel her maker rescued her from her human life where her husband Henry liked to use her as his very own personal punching bag. Sadly Azriel soon abandoned her as well and she existed for a century working as an assassin and thinking she was the only one of her kind left. Darian was a strong female but yet we still saw her vulnerable sides. After being burned by those she trusted she kept everyone at a distance. Including Tyler who lets just say is not what he seems. I really enjoyed being inside her head even if she swears like crazy at times. 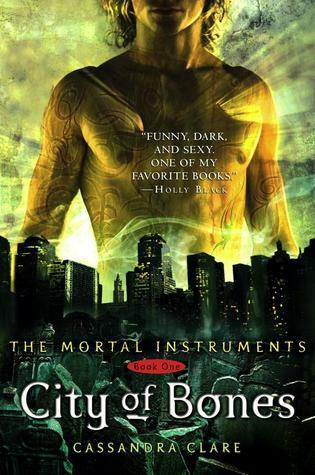 There are two love interests the main one is Tyler who apparently when you open up the book there is already an established connection between the two. I found this a little getting used to but it didn't take away from the book for me. The other interest is Xander the King of the Shaedes. I personally wasn't a fan of him, and Darian makes it pretty clear she doesn't care about him either. Honestly I really didn't understand where or how Xander's affections developed for Darian one minute she is working for him the next he is confessing how much he wants her. Personally I like the Tyler and Darian match he just has a more likable nature. 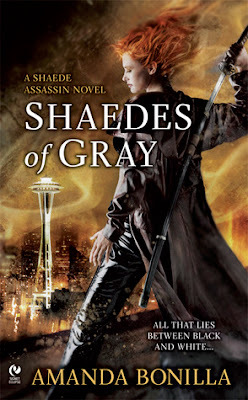 Shaedes of Gray wraps up nicely although there were a few things left unresolved which will obviously be addressed in Blood Before Sunrise the next book in the series. "I carried, tucked inconspicuously beneath my coat, a dagger and a short saber slung across my back. I never use guns-too impersonal." "Could I leave even if I wanted to? In to deep already, I'd been sucked into a world that might not let me go."